One of the things I really love about cooking is the satisfaction you get from making something from scratch, that is often bought ready made, and your homemade version turns out so much better. It really makes you appreciate the value of knowing how to cook and opens you up to a whole new world of better food. 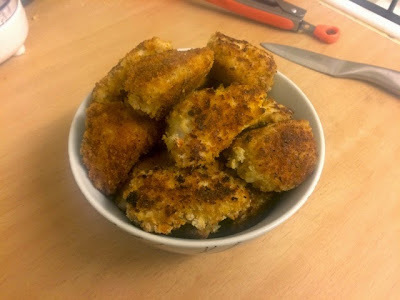 Everyone loves a chicken nugget, whether in breadcrumbs or batter. They’re everyone’s guilty pleasure and are hugely popular with kids because they’re familiar and easy. Nuggets or goujons are also a really popular hit when you’re doing a bit of a buffet. You could serve this as a popular meal to the kids, or equally posh it up a bit and have them with a dip as part of the nibbles at your drinks parties. They’ll go down equally as well with both crowds. I made these to have with a few party snacks on New Years’ Eve and both adults and children alike couldn’t get enough of them. The biggest plus point about making these for your family is that unlike the ready made ones, you know exactly what’s gone into making these. There are no hidden chemicals or preservatives, nothing added to artificially make it taste better and no crazy amounts of salt or sugar (I’ll never understand why there’s so much sugar in ready made savoury food products). 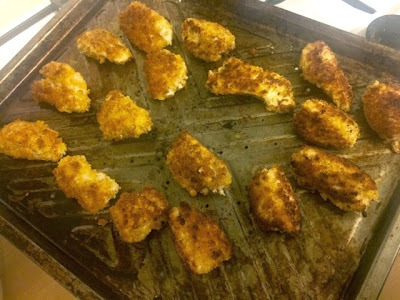 Chicken nuggets can be a healthy meal if you do it this way and serve with some salad or vegetables as well as some homemade fries. You’ll keep the kids happy by giving them what they want without having to worry about all the rubbish they’ve consumed. For the breadcrumbs, use up the stale ends of your weekly loaf and blitz them up in the food processor. This is a great way of reducing food waste. There’s always a bit of bread left at the end of a loaf that no one wants as it’s gone too hard. Rather than throwing away these ends, as long as they’ve not gone mouldy, make breadcrumbs out of them and keep them in a bag in the freezer. You’ll always have a supply of breadcrumbs to hand that won’t go off and they defrost in seconds when you need to use them, it makes so much more sense than buying a bag of breadcrumbs from the supermarket. 1. Preheat oven to 180ºC. 2. Mix breadcrumbs with the thyme and paprika and season well with salt and pepper. 3. 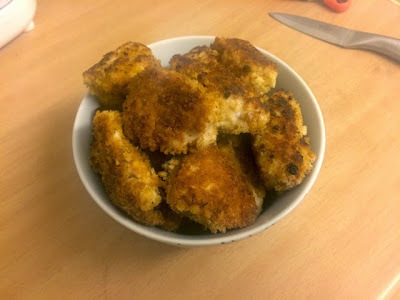 Dice chicken up into bitesize chunks and then use some small plates or dishes to form a ‘breading conveyor belt’. 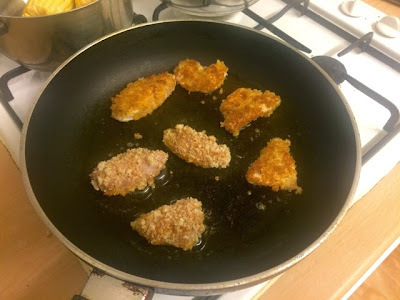 First you’ll need the flour, followed by the egg and then the breadcrumb mix at the end before an empty plate at the end to put the finished nuggets on. 4. 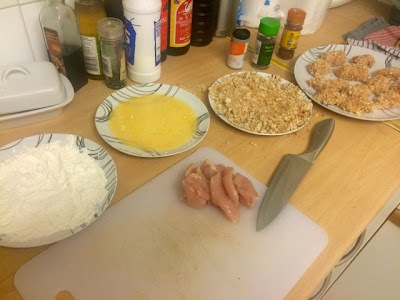 Dip each chicken piece in each dish, always keeping the same order: flour, egg then breadcrumbs. To keep from getting in a sticky mess try and keep one hand for dipping in wet ingredients and one hand for dipping in dry ingredients. You’ll inevitably forget and still get a little bit messy but it does make life a little easier. 5. Heat a little oil in a large frying pan and fry your nuggets on each side, just long enough to make the coating go golden. You’re not trying to cook the chicken through at this stage so do in batches and remove when the breadcrumbs look nice and crispy. Place them on a baking tray. 6. Bake in the oven for 10-15 minutes to finish off. Slice the thickest one open when you take them out to check they’re cooked through.